San Francisco Antique Rugs and Carpets - The beautiful bay city of San Francisco is a haven of art and culture and home to many dedicated Nazmiyal customers, including savvy homeowners, collectors and well-known designers. We are proud to work with clients throughout the San Francisco Bay Area, including those in Corona Heights, Pacific Heights, Ingleside Terraces, the Marina District, and the upscale South of Market area. We work with clients on both coasts of the United States, and it is our mission to connect shoppers with the ideal antique carpet for any space, style and decorating needs. For 30 years, we have taken great pride in assembling the largest and most complete collection of handcrafted rugs and textiles from all eras and continents. For the luxury designer, we have over-size antique rugs from Persia, Turkey, India, China and beyond. For the mid-century modern enthusiast, we have Scandinavian rugs and signed art carpets designed by Miro, Picasso and great 20th century rugs by artists. Plus, we have an unparalleled selection of vintage rugs, textile art pieces and antique carpets from many niche groups and lesser-known areas that are equally acclaimed. Our complete collection of antique and vintage rugs, which can be viewed online, shows exactly why the best designers come to us whenever they need a unique carpet for a unique project. To create a more accessible and convenient online rug-buying option, we offer free shipping from our New York City showroom to San Francisco or anywhere in the continental USA. Our free standard shipping offer applies to any one rug, regardless of its size or value. We'll work with you throughout the process from selecting the perfect item to making shipping arrangements that fit your schedule. Whether you live in SoMa, the Marina District, Ingleside Terraces or the scenic San Francisco Heights, we'll be happy to accommodate your individual needs, tastes and schedule. Browse through our online rug catalog to see why customers and designers in California and all parts of the country choose Nazmiyal Collection. Shopping for carpets online isn't always easy, but we believe that it should be. That's why we offer two industry-leading guarantees to help you enjoy a worry-free shopping experience. Savvy customers come to us because we offer fair, transparent prices. Our strong buying power and years of experience allow us to offer a low price guarantee on antique rugs from all over the world, when compared to pieces of a similar age and quality. Customers can also take advantage of our 100 percent satisfaction guarantee, which applies to all purchases. To make sure you're totally satisfied, we encourage you to see the carpet in your home and live with it for up to 72 hours before making a final decision. If you aren't happy for any reason, you can send the item back and only pay return shipping. Plus, our customer service representatives and carpet experts are always available to answer questions and do anything we can to make your experience better. San Francisco: Why the Bay Area Can't Get Enough of Antique Rugs! 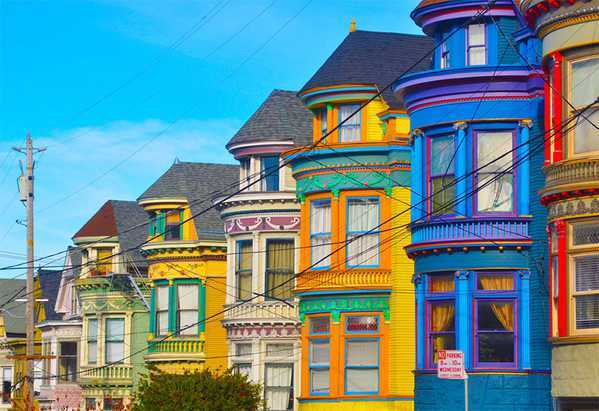 Painted row houses in San Francisco Homes showcase the city's unique style. San Francisco Rugs -- From the brightly painted Victorian row houses that line the city's streets, to its trolley cars and famous Golden Gate Bridge, San Francisco is a city with a lot of character. Having a very cosmopolitan nature, the Bay Area has always been at the vanguard of modern art, design and culture. In the field of design, the city’s interior designers are known for their creativity and innovation. Designer Cory Systrunk, who runs the Rapt Studio, one of the top interior design firms in San Francisco, describes his city as an innovation incubator that naturally attracts people willing to do different things and push the envelope a bit. As a self-styled “Green City," the Golden Gate City puts great emphasis on sustainable lifestyle. The city’s architects and interior designers aim to create living spaces that are beautiful, functional and eco-friendly. The combination of a love of vibrant character, and an emphasis on environmentally conscious living makes antique rugs and carpets incredibly popular in the bay area. 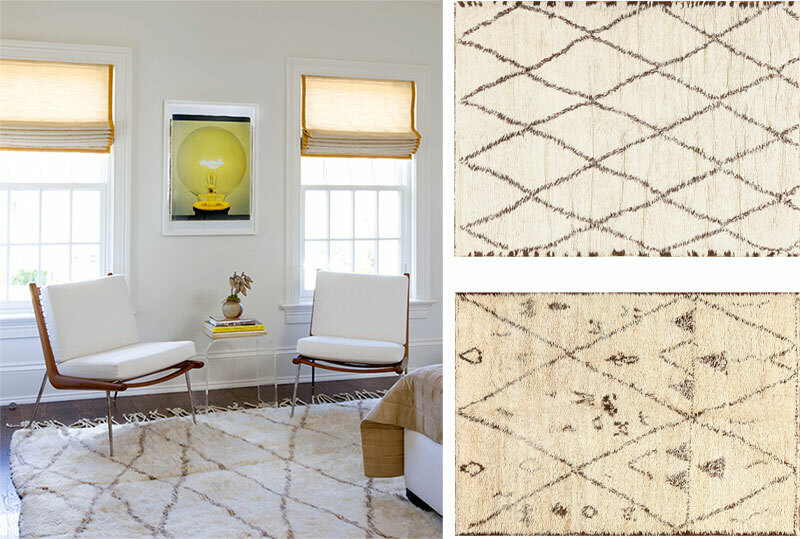 Eco-Friendly: Antique Rugs are sustainable and natural. 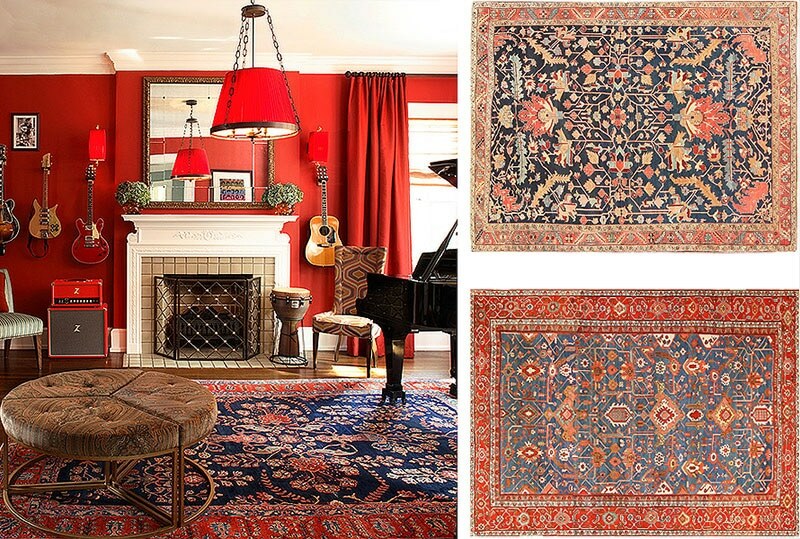 On left: Beautiful traditional interior featuring an antique Persian rug. Right: Similar styles (top: 47295, bottom: 48006) from Nazmiyal. Antique rugs are one-of-a-kind works of art, and if there's one defining characteristic of San Franciscan style, it's a love for the eclectic and unique. Because each antique rug is unique, there is a style to fit well with any kind of home décor – whether it is modern or traditional. In a modern interior décor, they add luxurious beauty combined with a sense of history and nostalgia. In a traditional décor, they enhance the beauty and add an air of opulence. Stylish San Franciscans decorate their home to reflect their personalities, and there is an antique rug or vintage carpet for every taste. Modern Style in San Francisco. Left: Contemporary interior featuring a vintage Moroccan rug. Right: Similar examples (top: 47946, bottom: 48391) from Nazmiyal. San Francisco is also known for its eco-conscious nature. With their implementation of the city's "eco-districts" plan, San Franciscans have shown their dedication to reducing the damage to the environment that cities are commonly responsible for. Because antique rugs were woven by hand, from natural materials, they are a great eco-friendly alternative to factory-made new rugs. Because antique rugs for the most part were made with natural dyes, there are no harmful chemicals involved in the rug-making process. Finally, buying antique is a great way to recycle and make use of existing products. San Franciscans love antique rugs because they are a great fit for the city's pledge of sustainability. Though located in New York, Nazmiyal's comprehensive website offers San Franciscans the opportunity to shop our world-class collection of antique rugs and vintage carpets from the comfort of their own homes. We offer free shipping to California for private customers, and give our clients the option to try rugs in their homes before making their final decision to buy, so with Nazmiyal Collection, your rug purchase is virtually risk-free.